The I Ching, pronounced “ee cheeng“, sometimes written as Yi Jing and also known as The Book of Changes, is an extraordinary classic text. The book is not commonly recognised or discussed in the West, yet surprisingly many people have an old copy tucked away somewhere on their bookshelf or have encountered its Chinese Taoist wisdom during their experimental student days, perhaps without progressing the experience further. When I hold workshops on the I Ching at Peak House Practice I’m always amazed at the sheer variety of I Ching books my students have amassed, often without ever fully understanding or accessing its wisdom. The I Ching is one of the oldest and most spiritual books in the world and, coupled with the Tao Te Ching,it makes up the fundamental sacred teachings that command a special place in all Taoist’s hearts. For many Chinese thinkers and philosophers the I Ching is as important as the Bible is to Western society and philosophy, although it’s read and consulted in a totally different way. The I Ching is essentially a means of obtaining spiritual guidance, inspirational insight and Universal wisdom. It can help with personal development or provide encouragement in finding authentic understanding and solutions to the questions or decisions that are of importance to you at any given time or situation. The book acts not only as a spiritual compass but also offers a wealth of beautiful poetry and Chinese philosophy that stretches back 5000 years into the origins of ancient Chinese customs and values. Its wisdom has the potential to stimulate your sensitivity, creativity and resourcefulness, even whilst experiencing the most challenging and demanding emotional periods of your life, often when those vital personal qualities are not so readily accessed. In this regard the I Ching can also be helpful as a meditation support, providing comfort and guidance. The text and subsequent visualisations that flow from its words have the power to stimulate a deep-seated personal authentic vibration. These mystical aspects are both challenging to explain and unique to each reader, but nevertheless the spiritual inspiration and experiences that result are as valid today as when our Eastern ancestors began consulting these ancient texts. Paradoxically there’s no need to study or even understand Taoist philosophy to appreciate or benefit from the teachings of the I Ching. All that’s necessary is the sincerity and aptitude to explore the concept of aligning with natural and Universal laws and the energetic polarities of Yin and Yang. To many Westerners polarity may mean opposites, as in ‘negative’ and ‘positive’. To understand and embrace the I Ching it’s necessary to abandon these rather fixed ideas and perceptions and instead appreciate that the seemingly opposing energies of Yin and Yang are in fact complementary. They are part of the whole or Oneness almost like a ‘cosmic web’ to be explored. Indeed, great insight and awareness can be gained by simply re-focusing your perception on the entirety rather than a single isolated part of the energy being contemplated or encountered (this principle relates to a profound Taoist teaching that was passed onto me when I was ordained and I have written several otherself-help/personal development articles on this particular subject). In the same way that night follows day, gradually and without division, or the seasons evolve into one other, it may be interesting for you to consider that nothing is fixed or ever unchanging; nothing is split into past, present or future; everything is interlinked and constantly moving and changing, always in a state of flux and transition. Quantum physics and cosmological research are now driving forward Western theories of ‘interconnection’ and ‘co-existence’ at an exciting pace. I’m heartened to read that ‘unscientific’ Taoist hypotheses on such matters, which were dismissed only a few years ago, are now receiving approval from earlier doubters! These concepts also relate to what Jung called ‘synchronicity‘ – a way of looking at things which connect one to another in unexpected ways. For example, you might be thinking of someone and then, apparently out of the blue, they arrive on your doorstep or they call you on the telephone. Or you may be worrying about a problem or situation and, seemingly by chance, you find an answer in a newspaper or magazine article you’re reading, or it seems to appear from nowhere. The truth is likely that the ‘answer’ has always been within you, sometimes overlooked, blocked or stagnated, but it is there nevertheless, waiting to be accessed! Another important principle examined within the I Ching is how to maintain this energetic vibration of interconnectedness by encouraging the smooth harmonious flow ofQi within yourself, your life and the world around you. There is no name or word in the West that directly translates the word ‘Qi’. The label that is often used is ‘energy’ and although this is a useful description I think the terms ‘life-force / universal-force’ or ‘love’ are perhaps more holistic and apt in widening your understanding of this profound concept. As with all types of energy, Qi comprises of Yang energy (active, masculine and powerful) and Yin energy (passive, feminine and gentle) to make it whole. 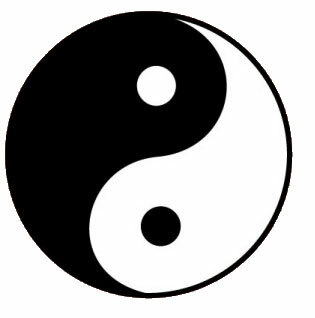 The balance between the two is ever changing and transforming and this is signified by the wavy, not straight, centre line (or Wu Wei line) in the familiar Yin-Yang symbol (also known as Tai Chi orThe Great Ultimate). The concepts of Yin-Yang and energetic balance and flow have a deep and meaningful relationship in your life and that of the Universe as a whole. Taoist thinking holds that everything in the Universe is generated from the Yin-Yang polarity and the flow between the two. And so it is that the philosophy of the I Ching welcomes change, movement, transformation, momentum and regeneration. The Chinese word ‘I‘ normally translates as ‘change‘ and the book is all about change: exploring and defining the changes that you’re presented with, which may be beyond your current understanding, as well as revealing possibilities for future change, action, or indeed inaction (the latter relating to the Taoist teaching of ‘Wu Wei’). Through the process of consulting the I Ching the numerous ideas that the book presents become a positive focus of your creative attention. In turn your thoughts and energy shift away from dwelling excessively on the stimuli, issue or situation being confronted and the emotional feelings you may be experiencing. This then allows you to begin to address the matter at hand in a more balanced, authentic and resourceful way. The change outlined in the text could be perceived as negative, positive or any possible scenario in between the two. This is the wonder and joy of the I Ching and a point which many people misunderstand. The I Ching doesn’t predict future circumstances or events and it contains no hard and fast rules or commandments. It simply highlights all choices, paths of action and possibilities open to you. It allows for your personal interpretation and meditation on the text and inspires you to look within yourself to find your authentic truth. Your subsequent decisions and actions will be determined only by your personal viewpoint and choice. I like to think of it as consulting my own very old, wise, inscrutable 5,000 year old Chinese sage. You may prefer to think of it connecting to your ‘inner guide’, ‘inner compass’, ‘intuition’, ‘gut feeling’, ‘guardian angel’, ‘spirit guide’, ‘Buddha’, ‘God’, or whatever concept feels most appropriate to you. To use the I Ching to its fullest you should approach the text with an open mind and without expectation. Allow it to stimulate and broaden your perspective on the situation or change you are encountering. Embrace and respond to it in a way that moves you onto your path of true self-worth. Seek to align with and incorporate the change rather that opposing or blocking it, thus ‘going with the flow’, holding your balanced ‘Wu Wei’, no matter how challenging or fearful it may emotionally feel at the time. When you go with the flow in this way you become more creative and authentic, you begin to let go of past and outdated modes of conditioning and thinking that no longer serve you and your authentic potential. And so it follows that if you alter your perception of the present your future must change. Remember: the ancestor of your current situation is a thought, and the same principle applies to your future. The I Ching offers a source of self-enlightenment, appreciation of your self-worth, and can empower you to reach your true harmonious potential. When you go with the flow, rather than clinging to the energy of an outdated situation, relationship or mindset, nothing remains fixed or rigid. You become open to all opportunities, which then flood into your life almost as if you’ve turned on a tap of Universal energy and love. If this all sounds a little familiar, it is – this ancient Taoist concept is exactly what advocates of the ‘Law of Attraction’ are talking about right now! The I Ching is made up of 64 chapters, each relating to a corresponding ‘hexagram’ which presents a particular message. Full details of the method of consultation are given in most I Ching books and I so will provide only a brief resume here. The first step in consulting the I Ching is to formulate a question and create a hexagram, typically though the process of throwing coins. 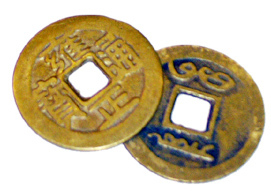 There are several other ways to consult the I Ching – one traditional method uses grains of rice, another uses yarrow sticks (allegedly because Yarrow grows on the grave of Confucius) but the main method used in the West is throwing coins, usually Chinese, although any coins will do the job. Before you cast the coins write down and meditate on the question relating to the stimuli, issue or situation you are facing. Being mindful to formulate the question ‘correctly’ can be an invaluable part of the meditative and enlightenment process. Then ‘throwing’ the I Ching is very simple: with your question in mind, shake the three coins in a cupped hand and throw them down when you feel the time is right – there is no time limit protocol. In throwing the coins the intention is to create a hexagram. Each hexagram is built up from a series of six lines, either broken or unbroken, which are considered to be a reflection of the energetic qualities of the situation at hand. A straight line ‘_______’ represents Yang energy or young Yang, and a broken line ‘____ ____’ represents Yin energy or young Yin. There is also another energetic quality which reflects the fact that the Yin or Yang energy of any situation is dynamic and thus may be at the point of transformation, either from Yin to Yang or vice versa. These lines are called ‘moving’ or ‘changing’ lines and a can be Yin moving/changing (old Yin) or Yang moving/changing (old Yang). It is the unique combination of the four energetic qualities and possibilities over the six lines of the hexagram that represent the energy of the whole of the situation you are consulting on. If you use the coin method, every time you throw your three coins the outcome can be translated into an energetic line. By throwing the coins six times you then create the six lines that become the whole hexagram. Once you have formulated your question you should select three coins which have an identifiable ‘head’ and ‘tail’ or two easily distinguishable sides that you can assign the following numerical values to: heads = 3 and tails = 2. By throwing the three coins their combined total value will fall between 6 and 9. For example, two heads and one tail would total 8, two tails and a head would total 7, three tails would total 6, etc. Note that moving/changing lines within the hexagram are often represented with an ‘x’ or ‘o’ in the middle of the line to indicate that the lines are changing from Yin to Yang, or Yang to Yin, respectively. The value and energetic line type of the first throw corresponds to the first or bottom line of the hexagram, the value and energetic line type of the second throw corresponds to the second from bottom line, etc. Repeating this throwing action six times then builds the hexagram from the bottom up. The bottom three lines of the hexagram are referred to as the lower trigram and the top three linesare referred to as the upper trigram, together they make up the whole hexagram. Once you have the trigrams written down you can consult the grid table which is printed in the back of all I Ching books to identify the name and number of the hexagram you will be consulting – this is your primary hexagram. Both the hexagram and the position of the two trigrams have very important meanings, which become evident as your reading progresses. In the example shown above the particular upper and lower trigrams shown are called ‘Sun’ and ‘Li’ respectively. Together they make up hexagram 37, called ‘Chia Jen’, translated as ‘The Family’. Each hexagram chapter is divided into two sections. The main opening text gives a broad overview of the message and should always be read. There’s also a series of six supplementary passages, each relating to one of the six lines of the hexagram. If you throw values of 6 or 9 and therefore have moving/changing lines within your hexagram you should also read the additional line passages that these correspond to for further guidance or insight. With the hexagram example above, the second and fifth lines are moving/changing and so the line passages two and five should also be read alongside the main opening text. Where moving/changing lines are present within your hexagram this can mean that the situation or question presented is in an extreme state of flux, unbalanced or due for immediate change and attention. In addition to reading the supplementary line passages within your primary hexagram chapter, the moving/changing lines can also be ‘allowed to change’: every old Yin (6) becomes a young Yang (7), and every old Yang (9) becomes a young Yin (8), and so a second extension (or relating) hexagram is created. Your two hexagrams can then be read together (the main body text and relevant line passages of the primary hexagram and the main body text of the extension hexagram) to disclose the full meaning of the guidance being offered. The upper and lower trigrams of this extension hexagram are called ‘Ken’ and ‘Ch’ien’ respectively. Together they make up hexagram 26, called ‘Ta Ch’u, translated as ‘The Taming Power of The Great’. This whole process can seem a little mechanical and cumbersome at first but don’t let it prevent your authentic consultation. The methodical and mindful nature of the practice is actually very important as it slows down your highly stimulated human-centred mind allowing you to access your more meditative, creative Tao mind, enabling a true reflection of the current situation or issue to manifest. In this article I’ve covered the basics of my philosophical interpretation and practice of consulting the I Ching. I intend to expand upon both these aspects in much greater detail in future posts on my website, but for now I hope this introduction has whetted your appetite sufficiently that you seek out and dust off that old copy of the I Ching that may have been sitting neglected on your bookshelf or that of a nearby bookstore! For me the I Ching represents an entire ancient philosophy and so should be treated with respect. It symbolises the cyclical interconnectedness of the Universe and is a guide to a personal path of balance and harmony (Wu Wei) that follows natural laws which Western scientific endeavour are slowly awakening to. Most importantly the I Ching does not give you the ‘answers’, rather it empowers you and encourages you to look within. Paradoxically, it appears mystical simply by emphasising your own phenomenal nature! Remember: authentic inspiration originates from being at one with yourself, nature and the Universe. You came from Source, you return to Source, therefore YOU ARE SOURCE.